The VESA-compliant DWM2655M swivel/tilt wall mount allows you to mount your flat-panel television, monitor or other display on the wall. Ideal for home theaters, classrooms, boardrooms, hotels, bars and restaurants, it fits most flat-panel displays from 26 to 55 inches.Adjust the display's viewing angle to fit your environment and comfort level. A 120° swivel, -15° to +15° tilt and -5° to +5° screen level adjustment capability minimizes glare and provides comfortable viewing from multiple angles.Durable all-metal frame with scratch-resistant powder-coated finish supports up to 50 kg (110 lbs.). Mounting hardware included. Built-in bubble level allows accurate display leveling. Conforms to VESA-compliant displays with any of the following mounting hole patterns: 200 x 200 mm, 300 x 300 mm, 400 x 200 mm and 400 x 400 mm. Maximum Adjustable Depth 20.27 in. 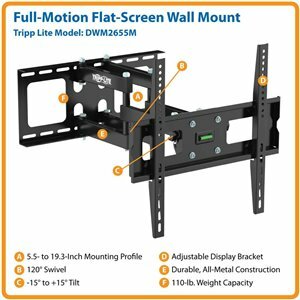 Tripp Lite’s VESA-compliant DWM2655M Full-Motion Flat-Screen Wall Mount offers full-motion articulation and can free up valuable space in your workstation by allowing you to effortlessly reposition your display at any time, even after installation. Its sleek design features convenient one-touch display adjustment with tilt and swivel capabilities and fits most 26- to 55-inch flat-panel displays. Its durable, all-metal frame with scratch-resistant, powder-coat finish withstands the stress of repeated use and blends easily into any décor. It comes with all necessary mounting hardware and supports weights of up to 110 lbs. A built-in bubble level enables accurate display leveling. For peace of mind, the DWM2655M comes backed by a 5-year warranty and green, RoHS-compliant design. The DWM2655M easily adjusts to optimize viewing angles and makes the most of your display environment. It upgrades existing displays with a -15° to 15° tilt range and 120° swivel capability to minimize glare, provide comfortable viewing angles and reduce fatigue. It is ideal for airport informational displays, classrooms, hotel conference rooms, point-of-sale displays, production studios, security stations and any display application that requires repeated repositioning. VESA (Video Electronics Standards Association) is a professional organization whose purpose is to promote uniformity in the video electronics industry by developing industry-wide interface standards for a wide variety of products, including flat-panel TVs and monitors. Most manufacturers of display mount products comply with these standards by adhering to a series of universal mounting hole patterns on the backs of the products. The DWM2655M is guaranteed to work with VESA-compliant displays with hole patterns 200 mm x 200 mm, 300 mm x 300 mm 400 mm x 200 mm and 400 mm x 400 mm. In order to ensure that the DWM2655M is right for you, measure the vertical and horizontal distances between the holes on the back of your display or refer to your display’s owner’s manual. The DWM2655M’s durable, all-metal frame supports displays weighing up to 110 lbs. and withstands the stress of repeated adjustments and use in common areas. Its scratch-resistant powder-coat finish tolerates frequent handling. The DWM2655M comes with all the hardware you need for installation. Included fasteners enable installation on walls with timber or masonry construction, including wooden studs, cinder blocks, bricks and concrete. Installation is simple: just mount the wall frame, connect the display brackets and hang the display. For accurate leveling of your display, the DWM2655M is equipped with a built-in bubble level. The DWM2655M is manufactured in compliance with strict RoHS specifications, reflecting Tripp Lite’s commitment to environmental responsibility. For peace of mind, it comes backed by a 5-year warranty.